« Time for a Make-Over…. 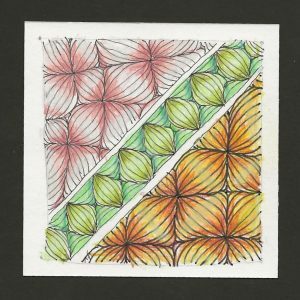 This week’s challenge is to draw a monotangle tile with Carole Ohl’s tangle, PUF. Using a tile I cut from Mixed Media paper, I decided to see what would happen if I put the tangle in a “wonky” grid. After I completed the tile I realized that my “wonky grid” wasn’t so wonky after all. But, because I always show the first tile I complete for a challenge, it is what it is. The middle uses the tangle as a border and the right side is drawn using a Micron 08 pen instead of an 01. Although it isn’t my favorite tile, I learned a lot doing it.